HomeNewsMeet you at the Red Pole Park! Now that the flowers are reaching full bloom in the Southfield City Centre, there is another area of growth blossoming along the new Northwestern Highway shared pedestrian-bike path. That new development is the Red Pole Park. Over the past few weeks, dozens of red poles have been installed along the shared-use accessible greenway that is fast defining the City Centre. 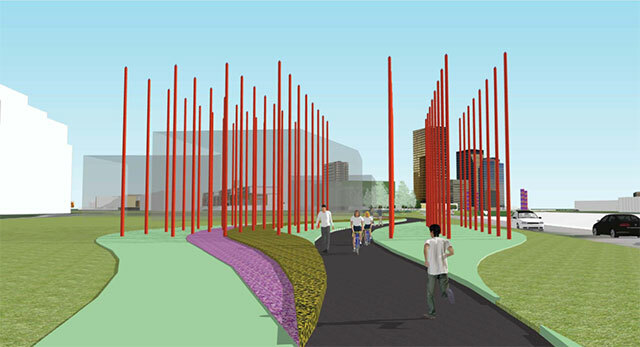 The Red Pole Park is an interactive site that encourages individuals to walk through, touch, and experience. The park spans 140 linear feet, and initially will include 47 red poles that symbolize a conscious choice to embrace civic values in the community, and to uphold sustainability, stewardship, and education. The various heights of the poles represent the past histories, present goals and accomplishments, and future growth that will be nurtured in the generations to come. The first in a series of outdoor spaces specifically designed for public interaction, the Red Pole Park is a project of the City of Southfield and the Michigan Economic Development Corporation’s Public Spaces & Community Places program. The Pubic Spaces & Community Places program is a collaboration between the MEDC, the Michigan State Housing Development Authority, the Michigan Municipal League, and Patronicity, a Michigan reward-based crowdfunding platform that allows residents to raise funds for projects that will be matched by grants from public entities. Through the crowdfunding effort, the City Centre raised $55,000, and the MEDC matched $50,000, the maximum dollar-for-dollar grant amount. The place making installation will add a colorful and unique vibe to the area, will signal community vitality, and will become a highly recognizable addition to the many art pieces in the Southfield City Centre. “Our mission in the City Centre is to create and maintain a vibrant, pedestrian friendly space that residents and visitors will really enjoy. The Red Pole Park will certainly be iconic, and will serve as a visible beacon for travelers up and down Northwestern Highway,” says City of Southfield Director of Planning Terry Croad. Walk through the Red Pole Park, or rent a Zagster bicycle from any of the bike share stations in the City Centre, and ride through the park. Stop and consider what the park stands for, and let us know what you think of this exciting, visual, interactive new feature of the Southfield City Centre.